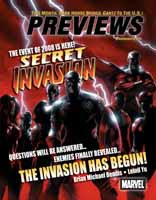 The February 2008 issue of Previews (I've got the front and back covers posted to the left) has an ad for Devil's Cape in the books section, page 404. Please let your friendly neighborhood comic book store know about the book and encourage the owners to order a few copies. Wizards of the Coast is mostly marketing Devil's Cape and the other Discoveries titles in traditional bookstores, but I'd love to see it popping up in comic book and game stores. Its superhero themes certainly mesh well with that type of store and, of course, I'd love just to get the book out in front of people's eyes to raise awareness of it. It was exciting seeing it in the store today and showing it to the people there (of course, they already know about the book, since they're hosting CAPE). On May 3, I'll be autographing copies of Devil's Cape at CAPE (the comics and pop culture expo), a Free Comic Book Day event, at my favorite comic book store, Zeus Comics, in Dallas. The guest list is full of some pretty awesome people I'm looking forward to meeting, including Mark Waid, Gail Simone, Robert Kirkman, and James O'Barr. You can read more about CAPE here. I picked this one up from Jeff's Gameblog. 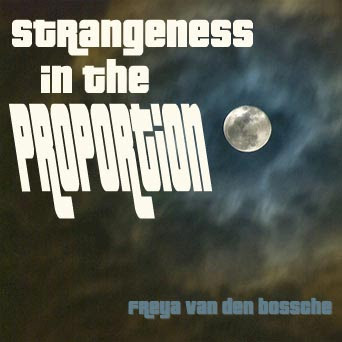 The idea is to come up with a concept album cover based on certain pretty strict parameters. Mine is above. I kind of dug how it turned out, but I was lucky enough to draw a decent quote ("strangeness in the proportion" comes from Sir Francis Bacon, by the way: "There is no excellent beauty that hath not some strangeness in the proportion"). The meme rules are after the jump. 03. http://www.flickr.com/explore/interesting/7days/ The third picture, no matter what it is, will be your album cover. So would you buy the album? What tracks would be on it? 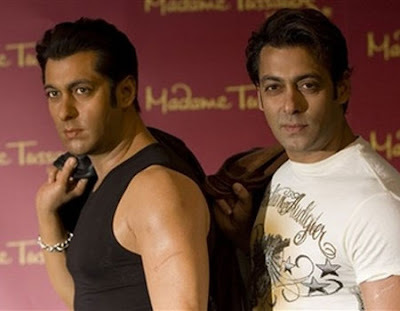 This poor guy, a Bollywood actor named Salman Khan, has had a fatwa issued against him for allowing Madame Tussauds to create a wax figure of him. Sigh. I'll just say that I don't think the dude deserves a fatwa and leave it at that. But here's my question: Can you tell which is the man and which is the wax figure? That Madame Tussaud is pretty talented. Side note: Anyone know why Tussauds doesn't have an apostrophe? 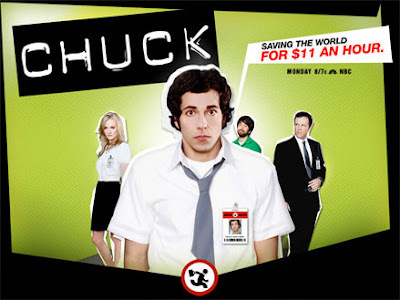 For my fellow Chuck fans out there, FYI: Chuck is on tonight, twice, in two new episodes "sandwiching" Celebrity Apprentice. This seems like really stupid programming to me, along the lines of what I complained about for the Terminator: The Sarah Connor Chronicles premiere. I mean, you've got a show that's somewhat established and has a following, its viewers are used to watching it on Monday nights. Why drop in two new episodes on a completely different night? I feel like there's some executive anxious to cancel the show, expecting it to tank in this slot and then planning to use the bad ratings as a "see, I told you so" excuse. But what do I know? Anyway, if you like the show, please watch or record it. Don't give them an excuse to cancel this one. Ever wonder whatever happened to Rick Moranis? Okay, here's something I'd definitely drop down $49.99 for. Now I just need someone to make it. 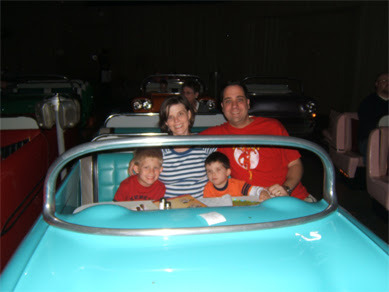 The Sci-Fi Dine-In Theater at Disney Hollywood Studios (formerly Disney MGM Studios) is one of my all-time favorites, a "can't miss" anytime I make it to the parks. 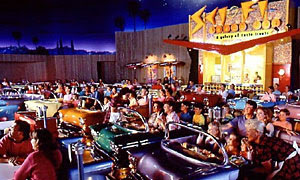 It's a large building with "cars" inside (the picture at left shows it nicely) and you sit in your table-equipped cars and order your meal while watching a drive-in movie reel populated with 50s-era shorts, cartoons, ads, and movie trailers. The food is good (my mother recently said that the hamburger was the best she'd ever had)--a combination of things like burgers and shakes with pasta and salad offerings. But the real seller here is the atmosphere--the darkened area, the drive-in screen, the campy footage. The restaurant shows the same movie reel over and over again. It lasts somewhere in the 40 to 50 minute range, so you generally don't notice any repetition unless you tarry too long (and with a huge waiting list filled with other park guests waiting to get in, you shouldn't do that). I love the reel. It's fun and silly and retro and engrossing--the kind of thing that equally captivates a wide range of people (like my mother, Dina and me, and Alex and Zack--three generations of riveted watchers--that's us in the picture, in case you didn't guess. Yes, I'm wearing a Flash T-shirt. Yes, it's Barry Allen. No, I'm not the hippest cat on the block. Or maybe I am...). And every time I see it, I get a strong urge to watch some old sci-fi movies. Particularly, of course, the ones featured in the restaurant. Some enterprising soul recorded the list of features and trailer here. I won't list them all in this space since some of them are his shorthand references to the various shorts (like the self-driving electric car or the frying saucer) and some of the references he made I don't understand enough to translate (what's "Garco and WED"?). But I will list the movies below. Anyway, here's my proposal: Disney should create a DVD package that includes the entire reel, plus copies of all the classic movies on the trailers. They could sell it through regular venues, although of course it would be a perfect souvenir of the restaurant itself. I would totally, totally buy this. A lot of the movies are available individually on DVD or in various compilations, but what I'd like is a nice, slick, remastered DVD set containing all of them. What fun! Oh, and a nice, juicy cheeseburger and a chocolate shake to go with them would be nice, too. Charles Tan of the Bibliophile Stalker site interviewed me recently about Devil's Cape. 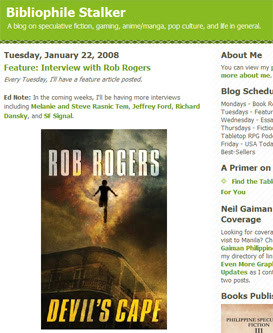 He's posted the interview on his site. I enjoyed the interview. Thanks, Charles. You can read the interview via the link below. When you're done, check out some of the other coverage on his site, including interviews with A. Lee Martinez and my fellow Wizards of the Coast Discoveries author, J.M. McDermott. I thought I'd start a new feature here where I can list some of the things I'm reading, watching, etc. and say a few words about them. Assuming I like or approve ofe them, they'll wind up in the handy dandy new Amazon store I've set up with things I'd recommend to others without reservation (at least, when those things are actually sold on Amazon). 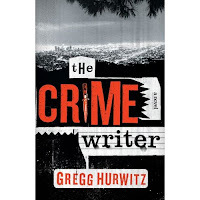 The Crime Writer , by Gregg Hurwitz. Very impressive so far. I'm not sure where I read about this first, but I put it on my Amazon wish list, got it as a Christmas present, and have really been enjoying it. The premise is that the narrator is, himself, a hardboiled crime writer in modern Los Angeles. He wakes up in a hospital on the first page to find out that he's had some kind of major incident and that he's the primary suspect in a murdr. The real trick here is that as he begins to find out what's happened to him and to attempt to regain memories of a lost, traumatic night, he does what he knows: He writes about it. It plays around with metafiction in interesting ways. I'm not to the end yet, but am thoroughly enjoying the ride so far. I'm also reading Pulp Hero and boy is it getting me jazzed to run some pulp adventures. The Hero System really set the stage for great pulp gaming materials with Justice, Inc., years ago, and the latest incarnation, Pulp Hero, seems very meaty. It's hard to go wrong with a book that has a section header reading "Add More Yaks." Steve Long is sometimes a bit long-winded and a little dry (I miss the zestier writing he used back in the days of Watchers of the Dragon), but the pulp background details and genre concepts are well-researched and interesting. There's a lot to this book. Some of it (biographies, timelines, etc.) is more general historical reference that feels kind of like extra weight, but on the other hand, it's all very useful information for anyone role-playing in the genre and it's pulled together with an eye for what is going to be most interesting and relevant for gamers. 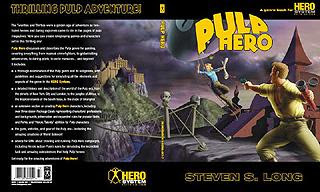 If you're interested in Pulp Hero, check out the Hero Games store (I could give you an Amazon link so that you could pick up a used copy and I'd get a small kickback from Amazon, but I'd rather that Hero Games got the money here). Some of my best gaming moments ever were at GenCon at the Justice, Inc. events. This is firing me up to play some pulp adventures. Big time. I also picked up The Best of the Spirit from the library not too long ago. Wow. Will Eisner is a legend in the comic book industry, but not one whose work I'd explored in any depth. These stories date back to the first appearance of the Spirit back in 1940 and advance beyond. They feel particularly advanced and sophisticated for that era and laid the groundwork for a lot of stories that followed. It's just a fun, fun read, and makes me wish I'd started exploring the Spirit earlier in my comic book reading life. On the other hand, the fact that I haven't read the Spirit up until now means that I have a lot of very good stories in front of me to discover, something else I'm excited about. I haven't delved too deeply into the book yet, but I look forward to doing that, and maybe picking up a copy for my home library. 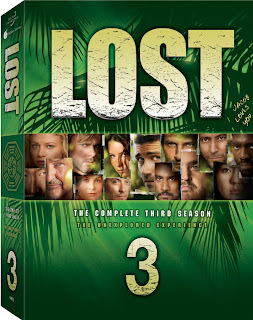 Through a combination of working on my book, a conflict with a show that Dina and I watched together, and timing, I ended up missing Lost season three, deciding to wait for the DVD instead. It was a long wait--I'd expected it to be released in September or so like the previous season, but when they decided to delay the season four premiere, they delayed the release of this DVD set, too. I got a set for Christmas, though (thanks, Mom!) and have been trying to plow my way through them before the show returns at the end of the month. I'm not likely to make it (I've watched eight episodes so far), but I should be close enough that I won't fill up my TiVo with season four episodes before I can start watching them. 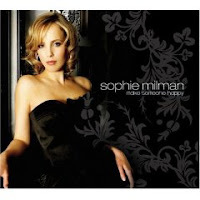 Sophie Milman's jazzy, eclectic, velvet-toned new CD, Make Someone Happy, lives up to its name. I smile when I listen to it and it's just got some very nice tunes. I always enjoy "Fever" and her take on it strikes me just fine. I also like the title track and "People Will Say We're in Love"--the whole CD, really. I heard Milman first in a profile on NPR and was intrigued enough to drop the CD onto my wish list. She's a Russian-born, Canadian, Jewish jazz singer. And she's awesome. I highly recommend this one. It's good for quiet contemplation and for adding a little romance. I'm a sucker. My buddy and I went to see I Am Legend and I was enjoying the music and Will Smith held up a CD and said that it was the best CD of all time and of course I had to have it. 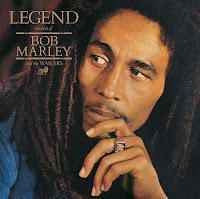 The CD is Legend: The Best of Bob Marley and the Wailers. Its use in the movie was a good, unusual fit and a good riff on the the names of the movie and the CD. Of course, it is a pretty damn good CD. Can't complain about Bob Marley and this is a good overview of his greatest songs, perfect for someone like me who is buying his first Bob Marley album. I particularly like "Three Little Birds," but the whole thing is solid and good to listen to in a variety of moods. That's it for today. Like the feature? Hate the feature? Let me know. A drink called Devil's Cape! Pour vodka, juice and energy drink over ice. Garnish with a lemon slice if desired. I should totally drink one of these to celebrate the night the book comes out. Someone has kitbashed some very cool Justice League of America action figures, giving them a Victorian look and feel. I'm having trouble picking a favorite. 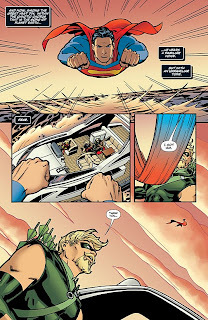 Aquaman is very cool, but so are the Flash, Hawkgirl, Green Lantern, Superman... jeez, all of them, really. You can see them in more detail on the source site, Sillof's Workshop. Thanks to Jeff at HeroMachine for the original link. It's covered over at the Evil GM's site, too. We watched and enjoyed American Idol tonight. It was about half an hour too long and spent too much time indulging a few wackos (the glittery woman who Simon said looked liked Willem Dafoe, the guy in the Princess Leia slave girl outfit, etc.). But it was fun and we didn't fast forward through much. I'm simultaneously looking forward to and dreading the Dallas auditions, wondering what kind of picture they'll paint of the Big D.
Dina and I didn't start watching the show until toward the middle of season five (the one with Daughtry , Katharine McPhee , Taylor Hicks , Elliott Yamin , etc. ), so I'm probably not quite as jaded as other viewers (I also missed big chunks of last season because I was working on revisions on Devil's Cape). Anyway, as a fan of the season and a particular fan of McPhee and Hicks, I picked up their CDs when they debuted, and recently got Yamin's CD for Christmas. As much as I liked McPhee and Hicks, their CDs were... not very good. A few good tracks on each (and "good" is pretty generous). Yamin's was even worse. I think I like maybe one song on it. And recent Idol winners and near-winners are getting dropped quickly by record labels. So what's the deal? They're enjoyable on the show. We root for them. They're solid entertainers. Why are their CDs mediocre? I guess it's kind of obvious, at least to me, but the songs are just bad. Yamin's CD even has a track ("A Song for You") with a line that says "I've sung a lot of songs and I've made some bad rhymes." Buddy, if your CD contains a slew of bad rhymes, and yours does, you sure as hell don't want to bring additional scrutiny to that fact. I'm not sure how much of the blame goes on the singers (I'd guess a little) and how much on the producers (I'd guess an awful lot--the buck should stop there), but the musical choices are just awful. 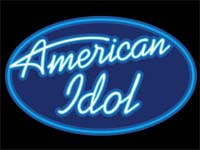 Let's think about American Idol a bit. It showcases talented singers (at least by the time you get to the end of the process) singing familiar songs. Good songs. We get used to Katharine McPhee or Blake Lewis or whoever lending a personal voice and vision to songs that are generally familiar to us. So why make their CDs so different. Why make Katharine McPhee's first album be filled with a bunch of crappy songs we've never heard before that don't showcase her talents particularly well? Keep in mind that I don't know anything about the contracts these singers end up with or what the rules are for licensing songs. But if I were producing a CD for an American Idol winner, I'd pick maybe a couple of new songs, if there was something that really showcased the winner's style. But I'd fill the album with music more like what the American Idol fans are used to hearing from the show. Katharine McPhee's "Over the Rainbow" is great. I downloaded the MP3 from iTunes. But it's not on her album. Why not? Why not have her sing some standards? Why not track down some songs that she didn't sing on the show, but that are available and known and that work for her voice? I'd look for songs that lended themselves to interpretation by the singer, rather than just straight reproduction of how earlier singers had done the songs. If my star had a country style, I'd look for some decent rock songs and make slightly country versions of them. And vice versa. I'd take good songs that you don't hear very often anymore and have our star make them new again (I'd love to hear "Dumb Things" more often). New songs are fine, but they're not what we're used to hearing from the Idol contestants and they have to be catchy and good if the singer is going to succeed. What bugs me is that these very talented and charismatic singers end up getting reps as failures when the fault really lies with the people making the song choices for their albums. I just stumbled across a very cool article about Joe Casey's comics career. He's an inventive, two-fisted writer and all-around cool cat. Take a look at his background in the article and then go buy something he's written (I'd particularly recommend Godland or Wildcats). Marvel has completed its new "One More Day" storyline. In a nutshell, Aunt May has been shot. Mephisto (a Marvel stand-in for the Devil) approaches Spider-Man and Mary Jane with a proposal: He will save Aunt May, but in return, they have to let him change history so that they were never married. Major, major blech. This one just hacks me off on several levels. The idea that Spider-Man literally makes a deal with the devil. The sloppy mess it makes of continuity. And especially the attitude that Joe Quesada and some of the creators have espoused that Spider-Man is more interested single than married, like there are no interesting stories to be told about married heroes. Another aspect that bugs me is a phenomenon I've seen often in comics. I don't really have a name for it other than "overly complicated back story." Iconic heroes (and Spider-Man is one) generally have fairly simple backgrounds. "Rocketed from the dying planet Krypton as a boy and developing amazing powers, Clark Kent grew into the hero of Metropolis, Superman." 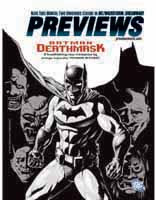 "Orphaned as a young boy, billionaire Bruce Wayne set out to strike fear into the hearts of criminals as the masked Batman." Etc. Etc. You can hang rich tapestries on the characters, but their backgrounds are easy to grok. Other characters, particularly those developed in the midst of other characters' comic books, are often much less iconic. Take Superboy (Connor Kent), for instance. In his initial back story, he was a clone created to match Superman, but he wasn't really Superman's clone (for reasons I can't remember--something about them not being able to get a good cell sample or Superman's cells being uncloneable). He was actually the clone of a character most people have never heard of, Cadmus chief Paul Westfield. His powers were like Superman's, but not exactly. And he couldn't age because he was a clone. In terms of background, he was kind of a mess. DC eventually retconned his background so that he was actually a clone of Superman and Lex Luthor. It didn't necessarily jibe with previous stories, but it was a heck of a lot cleaner and easier to digest. Don't get me started on the Matrix version of Supergirl and her background. "Hey, I thought he was married?" "Yeah, well, he was, but see, he made a deal with the devil and now his wedding never happened." "How exactly does that work? Is it like an annulment?" "No, I mean it never really happened. Not that any of it ever really happened, but you know what I mean?" "So, wait, these issues where he was married to the supermodel, and those comic strips in the daily paper, they're like, not real stories?" "So that issue where he fought Doc Ock and saved Mary Jane, that didn't happen?" "He still fought Doc Ock. He just wasn't married." "Huh." Scratches head, walks away, buys manga instead. I'd be very tempted to start picking up Spider-Man again with Dan Slott taking over as a writer. Unfortunately, I just can't bring myself to do it. I'm voting with my feet. Quesada said, "The truth of the matter is that if the fans truly want a married Peter and MJ with kids, then we have an incredible book called Spider-Girl. If this is truly what fandom wants, to see Peter go through the natural progressions of life, then I expect orders on Spider-Girl to go through the roof in the next month." He was being sarcastic. He's nearly canceled Spider-Girl more than once. But I'm picking up a copy of Spider-Girl this month (the next issue comes out Wednesday). I encourage you to do the same. You can read more about the Spider-Man stuff in Newsweek. But what concerns/burns me the most is FOX repeating the same stupid, show-killing premiere format as with Drive (another promising genre show, one that FOX drove into the ground). The show's normal timeslot is Monday nights, but they're debuting it Sunday night and following it up with a new episode the night after. It's just dumb--it requires a sudden, strong commitment from a public not used to it yet (it was worse with Drive, where they started it with a two-hour pilot, meaning that if you were intrigued by the show, you had to commit to three hours of viewing within 25 hours if you didn't want to be hopelessly lost). And I just don't get the sense of putting it on for the first time in a time slot you aren't going to have it occupy. It's not a good way to get people in the habit of viewing it and it's a piss-poor way to test out how it's going to work in its target slot. 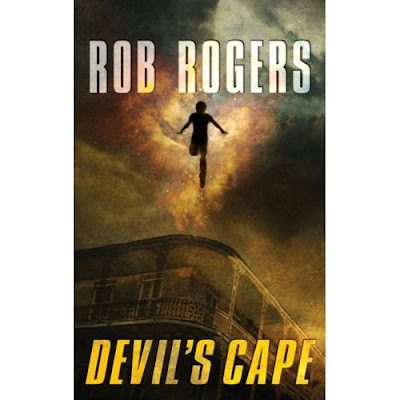 Devil's Cape by Rob Rogers, which originally was solicited by former executive editor Peter Asher. When cleaning out his office, Athans found the manuscript, read it, and "was hooked." Devil's Cape appears in April. Discoveries described it this way: "If New Orleans has earned its 'Sin City' nickname for its debauchery, then its nearby sister Devil's Cape has earned its 'Pirate Town' moniker for the violence and blatant corruption that have marred the city since its founding. In Devil's Cape, corruption and heroism walk hand in hand, and justice and mercy are paid for in blood. It is a city like no other." I'm incredibly lucky first that Peter Archer ("Asher" is a typo in the article) liked the book and second that Phil Athans found it in Peter's office and rescued it. I've got a link for HeroMachine in the links section of this blog, but I haven't written about it yet. This is an ultra-cool resource that lets you create custom portraits of characters from a variety of genres. It's the brainchild/masterpiece of Jeff Hebert, all-around cool guy* and great artist. It's like if you took my old favorite toy, Mighty Men & Monster Maker, and ramped up the awesomeness exponentially. I probably don't need to give a lot of background--just hop over to the site and play around there. But I will let you know about a neat contest that Jeff is running. He's giving participants who post images they've created through HeroMachine the opportunity to qualify for a drawing to get, well, a drawing--an original custom portrait that he'll create. You can read the details here. I've been fortunate enough to be the recipient of some of Jeff's original artwork before (I commented on some of that here and here), so I'm not fishing for more. But I thought it would be a fun opportunity to participate and show some of the cool (to me, anyway) images I've created over the years with the program. You can click on any of these for a larger version. This first one is Ari, a villain I created a while back for my face-to-face Champions game. He was one of a slew of human/insect hybrid characters I created for a storyline where a bunch of people in the campaign city were getting insect powers. Ari was a kind of crazy guy who venerated samurais, at least their outward trappings. His mutation (into an ant form) made him incredibly strong and durable and he gave the heroes trouble whenever he showed up. I like the flexibility that HeroMachine gives you in details, items, colors, etc. In this case, I took an ant head and put it on a skeleton body for what I thought was a pretty cool effect. The samurai trappings added to his oddness. He was fun. Next up is Fist of the Pharaoh, from another storyline in the same game. The characters had become involved in the magic of an ancient mummy. When they returned from another adventure (in a different adventure), they found that their city had been converted into a kind of hybrid of their old city and ancient Egypt, with Egyptian architecture and design, different themes and appearances for the inhabitants, etc. Oh, and of course everyone in the city was under the magical thrall of the mummy. 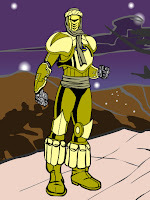 Fist of the Pharaoh was the Egypt-ized version of Stalwart, a Champions character from the Champions Universe book. This one is Miss Chance. She actually plays a small, but important role in Devil's Cape, and HeroMachine was a handy way for me to get my thoughts for character design into a visual format. This particular design is a little over the top for the general tone of my book, so don't be put off. I don't want to give a lot away, but she's basically a four-color/Silver Age character who makes the mistake of coming to the city of Devil's Cape to try to right an old wrong. Here's Cascade, a PC I play a lot in the campaign I run (he's added muscle for the team in a battle, a character players can pick up and run when their own characters are knocked out or off screen, and a character I can play when someone else takes a turn at GMing). Cascade is a mild-mannered high school math teacher and wrestling/swimming coach who can also turn into a huge mass of water. This is the only one of the images I had to PhotoShop a little bit, using layers to enable me to employ two different character forms for the dripping water effect. I'll wrap it up with this one, The Pirate Smasher, from my son Alex. He's had lots of fun playing with HeroMachine and "creating superheroes for your book, Dad." Anyway, HeroMachine is great fun and now it's even absolutely free since Jeff found a sponsor. Check it out, play around, have fun, and enter Jeff's contest. *Oh, but if Jeff disses West Coast Avengers, just try to ignore it. He clearly doesn't know any better. 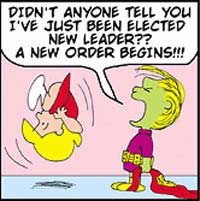 A friend of mine pointed me to a hilarious mash-up of Peanuts and the Legion of Super-Heroes. I was startled by how well the combination worked and at how skillfully the creator(s) handled it. The whole title is "You're a Good Man, Charlie Taine." There aren't many strips, unfortunately, and the last, best, and most intricate of them has the words "The End" instead of a "Next" link, but it's worth reading them just to experience what's there, at least if you're a casual or serious Legion of Super-Heroes fan. Hellnotes has a very nice review of Devil's Cape up. The references to the book jacket actually refer to the advance reader copy (ARC) rather than the final book. Take a look. 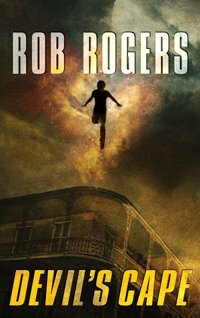 I was very excited to see that Amazon.com has the final cover for Devil's Cape up today, beating even the Wizards Discoveries site. I liked the old one okay, but really prefer the revised version, which features a more purposeful figure in the foreground, a building that looks more natural for Louisiana, better and clearer lighting effects, and a font that really seems to pop for me. One of these days, if people seem interested, I'll probably go into a little more detail about the cover process, at least from my limited perspective as an author (short version is that have input, but not the final word, although Wizards and the graphic designers involved were wonderful about keeping me in the loop and respecting my opinion). The art director for the cover and the book was Matt Adelsperger from Wizards. The cover artist is the talented Christian McGrath, which was a personal thrill for me because I'm a big fan of Jim Butcher's Harry Dresden novels and Christian McGrath is the most recent cover artist for those. This is the cover to look for at bookstores come April. What do you think? I like Connor Hawke. I've enjoyed him since he first showed up in Green Arrow. I enjoyed him when Oliver Queen was dead and Connor was the only Green Arrow. I enjoyed him when he was briefly a member of the Justice League of America. Things have looked a little grim for him lately. First, previews suggested that a member of the Green Arrow family might be dying and then, in last month's Green Arrow/Black Canary #3, when a bolt of energy from out of the sky skewered him. The series writer, Judd Winick, is a little hit and miss for me. He writes some very cool sequences--nice action, good characterization, funny quips. He also writes some bad ones, with characters acting out of character (some of his writing of Nightwing in The Outsiders is notoriously out of character). He tends to lean toward more violence and "sexing up" than I like in my four-color comics. The recent Teen Titans East special, where he seemingly slaughtered a whole bunch of characters, was an example of this. But he seems to love Green Arrow and generally does a nice job writing him. So I've been reading the Green Arrow/Black Canary title with "one eye open." On the one hand, I've enjoyed the ride so far. On the other hand, I fully intend to drop it if Connor dies. But this preview gives me the chills. It's beautifully rendered and nicely written. Yeah, it completely pulls a deus ex machina card, but it's still cool. Here's hoping the rest of the issue doesn't disappoint me. You can read more of the preview here. This strip is from Lio, one of my all-time favorite comic strip series--it's a clever, funny, occasionally dark series that is more likely to make me laugh than just about any I read. I guess "read" is a questionable term, since Lio is what the creator calls a "pantomime strip," containing no dialogue (although it does make frequent use of signs, notes, etc., so it's not entirely wordless). I usually keep up with it on the Seattle Times site here since it's pretty easy to navigate to the past couple weeks of strips if I miss a day. Be more patient. This means especially with my sons and wife, but also fellow drivers, people in general, etc. Write my next book. I've got notes and concepts for a sequel to Devil's Cape. Now I just need to get cooking and write the darn thing. Blog more frequently. I've been posting more frequently since early December, but before that, this site got pretty dusty for a while. I'd like to change that. Game a little more. I don't want to go crazy here (and gaming and writing sometimes seem to tap the same creative well, so I have to be careful not to let gaming take away from my writing), but I would like to get together with the guys and throw some dice around and talk in funny voices more often.